Despite the effectiveness of multiple treatments, including positive airway pressure (PAP) therapy, there are some cases when more invasive therapy proves necessary. The use of tracheostomy surgery in sleep apnea remains a largely curative, if occasionally problematic, option for those with difficult to treat or life-threatening sleep-disordered breathing. It may not be a first choice, but for some it can be the last, best option. Learn about the use of tracheostomy to treat sleep apnea. Tracheostomy is the surgical placement of an incision at the trachea, or windpipe, at the front of the neck. A small plastic tube can be inserted to keep the opening clear. This opening allows the movement of air to occur without using the upper airway, effectively bypassing the upper throat, tongue, mouth, and nasal passages. When sleep apnea is serious, it may be a necessary intervention. Why Use Tracheostomy in Sleep Apnea? Prior to the advent of continuous positive airway pressure (CPAP), tracheostomy was a more frequently used surgical treatment to cure sleep apnea. It works extremely well in the case of obstructive sleep apnea, which occurs because the upper airway collapses during sleep, leading to repetitive pauses in breathing. By removing the resistance of the upper airway, which is accomplished after tracheostomy as breathing occurs through an opening in the throat, sleep apnea is greatly improved. This can normalize oxygen and carbon dioxide levels and other symptoms. Tracheostomy may be used when respiratory failure occurs, and standard therapy, such as CPAP or bilevel, is not tolerated or effective. This may occur when sleep apnea is extremely severe and may be more common in people who are morbidly obese, as occurs in obesity-hypoventilation syndrome. It may also be required in children with developmental abnormalities that compromise breathing. 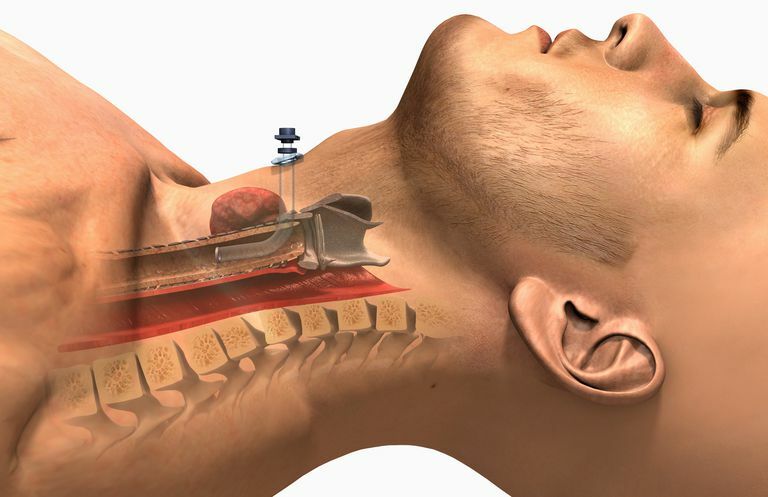 Speech may become difficult, requiring accommodations such as a "tracheostomy button." There can be significant adjustment difficulties, including disability and marriage problems. There is a risk of infection, especially recurrent episodes of bronchitis. A skin graft may be necessary to prevent excessive scarring at the trachea site. In obese patients, the surgery itself is more difficult and the tracheostomy button may also be more problematic. If considering a tracheostomy, obese patients need to also be aware that they may be at increased risk of failure with the procedure. In the case of obesity-hypoventilation syndrome, a variant of sleep apnea and respiratory failure present in obese individuals, there may be residual problems after tracheostomy. Decreased strength in the breathing muscles or a decreased ability to fully expand the lungs may result in continued breathing failure despite the procedure. As effective noninvasive therapies such as CPAP, bilevel, and other supportive devices are now available, tracheostomy is now rarely used to treat sleep apnea. It can, however, be a life-saving option for those who need it as a last resort. Camacho M et al. "Mini Tracheostomy for Obstructive Sleep Apnea: An Evidence Based Proposal." Int J Otolaryngol. 2016;2016:7195349. Epub 2016 Jan 26. Cielo CM, Gungor A. "Treatment Options for Pediatric Obstructive Sleep Apnea." Curr Probl Pediatr Adolesc Health Care. 2016 Jan;46(1):27-33. Epub 2015 Nov 17. Conway, W et al. "Adverse Effects of Tracheostomy for Sleep Apnea." JAMA 1981;246:347.